New Attorney General Loretta E. Lynch, the first black woman to take the helm, plans to improve the Justice Department’s reputation with police after her predecessor was criticized for too quickly and harshly criticizing officers over lethal force. Aides to Lynch told the New York Times that Lynch hopes to boost police morale and improve relations between officers and minority communities. “Loretta’s confirmation ensures that we are better positioned to keep our communities safe, keep our nation secure, and ensure that every American experiences justice under the law,” Mr. Obama said. 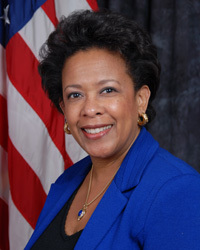 The Justice Department said Lynch is expected to be sworn in Monday. Posted: 4/24/15 at 9:17 AM under News Story.